The 10th season of the Challenge of the Americas closed out with championship Sunday at the Simraceway Performance Karting Center. Sunny skies greeted the Sonoma, California facility after three straight days of wet weather to the much welcome of those in the paddock. For a select few, history was on the brink with the results from the day to decide the 2017 series champions. The Nash Motorsportz Senior Rotax title appeared to be one that would go down to the wire with four drivers in contention heading into the weekend. Following Saturday’s events, it was down to two with two-time winner and defending champion Christian Brooks holding the advantage over Bryce Choquer. 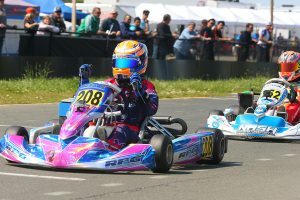 The two ended Saturday’s main event with controversy, after Choquer was penalized for cutting the track on the final circuit, those taking the win away from him and giving it to Brooks. Still with a chance at the title, Choquer elected to sit out Sunday’s action, thus giving Brooks the provisional title without needing points in Round Six. Out of the title chase, but still in the hunt for a piece of point standings hardware, Kellen Ritter put in the work to end the series a winner once again. The RPG / Kosmic driver came out of qualifying with the fast lap of the session (50.700) to edge out teammate Matthew Taskinen. Ritter however would be joined at the front in the Prefinal by Brooks and Nic LeDuc (Cambrian / Birel ART). LeDuc appeared to have the speed to win, with Brooks and Ritter keeping on him. On the final lap, LeDuc led going into the final corner. Brooks attempted a pass, and contact was made, sending both off the course and allowing Ritter to slip through for the win. Brooks stayed in his kart, and as he was about to pull away to cross the finish line, LeDuc ‘smacked’ the side of his helmet. Brooks would be given a 10-second penalty for the contact, and LeDuc removed from the event for the unsportsmanlike conduct. Ritter was able to get away early in the Final starting on the pole position, while Brooks fought his way through the field after starting ninth. It took Brooks just seven laps to reach the second position, and he quickly began cutting into the advantage Ritter held. Once on the rear bumper, the two went back and forth, sizing each other up for the final run. Ritter was able to get away with just three laps remaining, and held the advantage to the checkered flag to claim his second victory of the season. 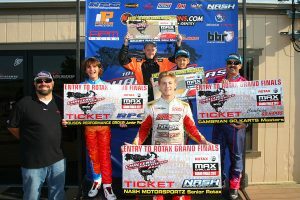 Brooks lost the battle, but won the war with his second straight series championship, taking the ticket to the 2017 Rotax Grand Finals. Behind them was a great battle for third with Senior rookie Taskinen earning the spot over Jacob Gulick (RPG / Kosmic) and Derek Wang (BBR / FA Kart). 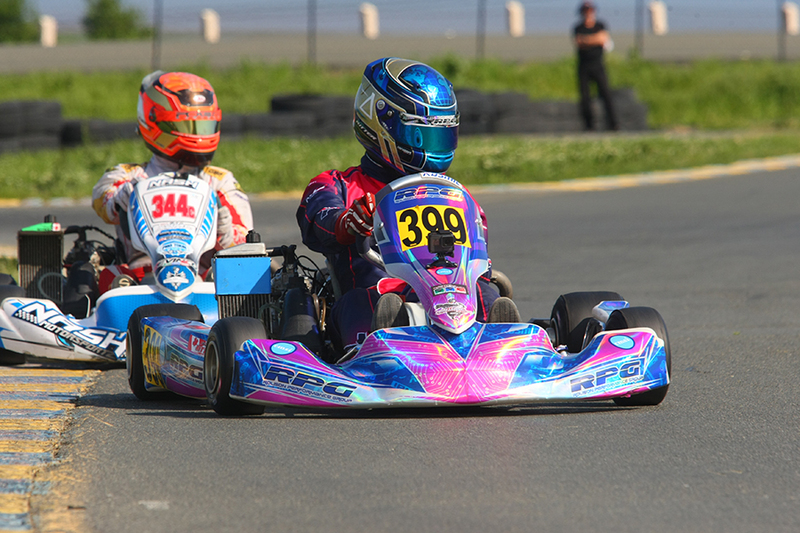 The unusual day in the Rolison Performance Group Junior Rotax Saturday kept the championship to just the two players – Jak Crawford and Hannah Greenemeier. Crawford still held the advantage with the drop, forcing Greenemeier to go perfect on the day. The RPG / Kosmic driver began on top, earning the fast time in qualifying (52.926) by just two hundredths over Crawford (Nash / FA Kart). The start of the Prefinal saw both Greenemeier and third-place starter Austin Torgerson (Ruthless / Tony Kart) spinning around in turn one. This gave Crawford a clean path to the win in the Prefinal. The show however was Greenemeier fighting her way from 19th all the way to second in just 17 laps. At the start of the Final, Greenemeier was on the aggression, working past Crawford for the lead quickly. Crawford locked in on her bumper and the two pulled away from the field. The two were evenly matched, and Greenemeier held off Crawford to earn first career victory. Crawford settled for second, taking home the championship in style to make his first trip to the Rotax Grand Finals as part of Team USA. Trey Brown (Nash / FA Kart) took the third spot over Griffin Dowler (RPM / Tony Kart) with Torgerson fifth. 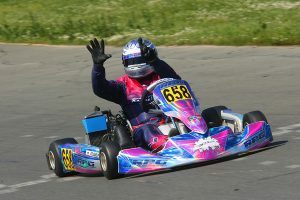 Billy Cleavelin was the first driver to clinch a 2017 Challenge championship with his fifth victory Saturday in the Cambrian Go-Karts Masters Rotax category. There was talk of him not racing Saturday, but that changed overnight with the veteran looking to make history. The speed was lacking and a mechanical cost his qualifying session, placing eighth as he saw local driver Kelly Heil (Cambrian / Birel ART) secure fast time. A solid lead group formed in the Prefinal, with Cleavelin knifing his way through them all. He took the top spot and drove away to the race win. There was no stopping the RPG / Kosmic driver, leading all 25 laps for his sixth straight victory to become only the third driver in series history to do so. Heil drove to the second spot with David Pergande (FTK / Tony Kart) rounding out the podium. John Breidinger (VRP / Tony Kart) placed fourth with Roman Alekseenkov (SSM / Tony Kart) came back to fifth after dropping to the tail of the field at the opening corner. It came down to two drivers in the APM Racing / M2 Image Solutions Briggs 206 category. Heat 3 winner and polesitter Austin Torgerson (Tony Kart) was joined by Derek Wang (FA Kart) at the start. They were able to break away from the field until Joey Wimsett (FA Kart) escaped the rest of the field and caught the top two. In the final lap, Torgerson lost the draft, leaving Wang and Wimsett to decide the finish. Wimsett ran the defensive line into the final corner, and Wang pulled the up and under move. The two drag raced to the finish line, with Wang crossing the line just 27 thousandths of a second ahead of Wimsett for the victory. Wimsett would receive a three-second penalty for a starting line infraction, thus promoting Torgerson to second and Griffin Dowler (FA Kart) to third. Promoter Andy Seesemann awarded $200 for third and $300 to second on top of the $500 prize for winning. The Junior class victory went to Logan Calderwood (Tony Kart) unchallenged after Ashton Torgerson (Tony Kart) retired on the opening lap. Even thought there were just two drivers in the Wallace Steel / BBR Karting Shifter Senior division, they put on a show all day long. The two were nose and tail throughout the Prefinal and Final, with each of them banking on the mistake of the other. Kyle Loh (Cameron / Aluminos) posted the fast time in the main event, but it was Zach Pettinicchi (VRP / Tony Kart) that came away with the victory by four tenths at the checkered flag. Ashton Torgerson dominated the day in the Brash Racing Mini Max division, sweeping the action en route to a 19-second advantage over Tuesday Calderwood (Benik) and eventual champion Jack Armstrong (Benik). It was the same for Sebastian Mulder (Benik) in the Podium Karting Micro Max category. Mulder led from qualifying to the final checkered flag for a 13-second margin of victory in the main event, clinching the series championship. Parker DeLong (Benik) drove to second in the race and title chase with Miles Hewitt (CompKart) standing on the podium in third. Tyson Quach (CompKart) and Patrick Molnar (Birel ART) completed the top-five.